Located atop the Blue Ridge Mountains, there are 6 cabins available year round. The Pioneer Cabin is an 1800′s log cabin with a fireplace and loft; the 7 Ridges Cabin has a loft and a beautiful view of the mountains from the large front porch; our 2 Mountain View Cabins also offer a wonderful view of the mountains. These 4 cabins are fully furnished, are rated for 4 people, but will sleep up to 6. Two new year-round cabins: the Spy Rock and the Crabtree are quaint, private and fully equipped with 2 bedrooms (one upstairs/one downstairs). 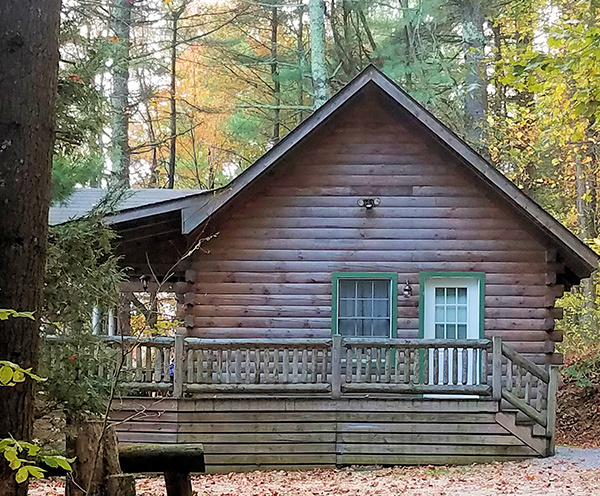 Our Lakeview Cabin (available April – October) is located on our 4 acre lake and is a camping cabin which sleeps 4 people. All units have gas log fireplaces. There is camping, fishing, horseback riding (nearby) and a country store with antiques, convenience & camping items, prepared foods, and seasonally, a large pot of chili and sharp cheddar by the slice. Located on Route 56, 3.5 miles east of the Parkway (MP 27).